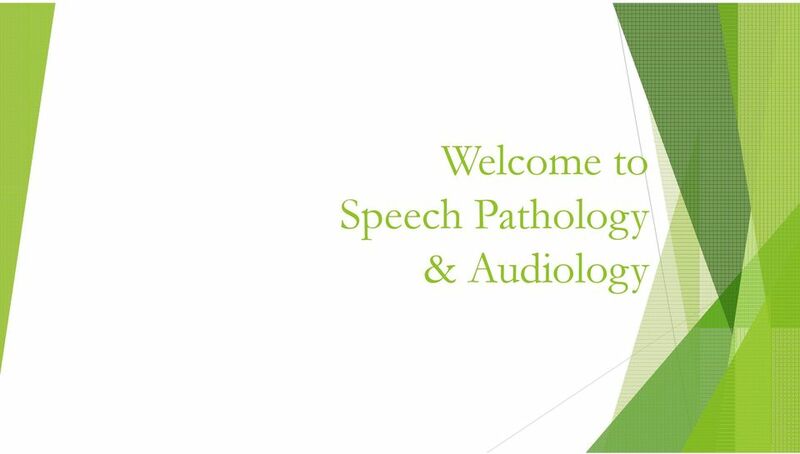 Download "Speech-Language Pathology and Audiology. 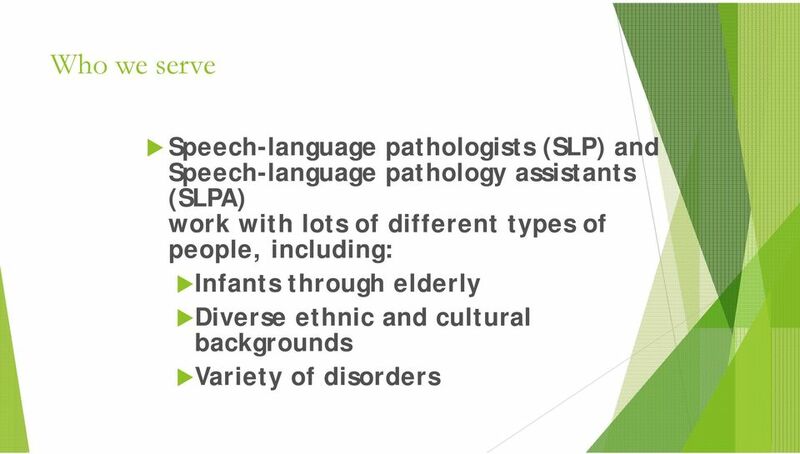 Group Orientation"
5 Who are Speech-language pathologists? 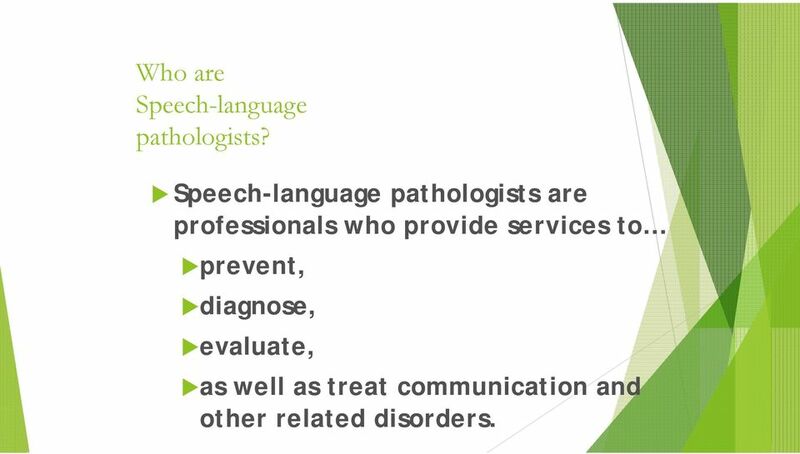 Speech-language pathologists are professionals who provide services to prevent, diagnose, evaluate, as well as treat communication and other related disorders. 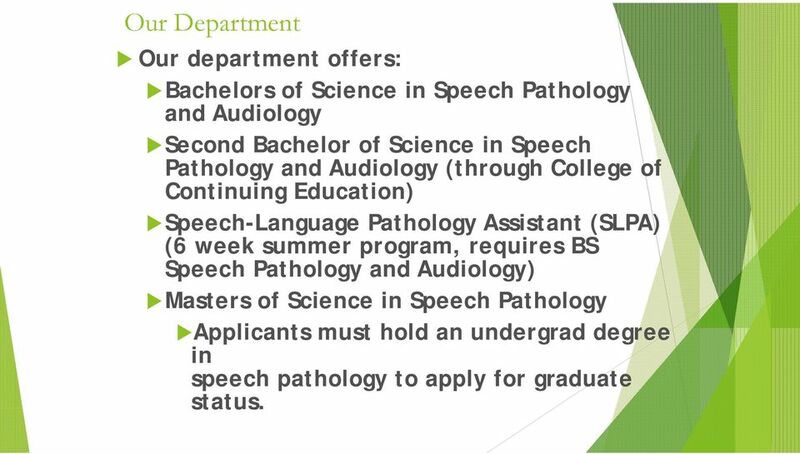 9 Our Department Our department offers: Bachelors of Science in Speech Pathology and Audiology Second Bachelor of Science in Speech Pathology and Audiology (through College of Continuing Education) Speech-Language Pathology Assistant (SLPA) (6 week summer program, requires BS Speech Pathology and Audiology) Masters of Science in Speech Pathology Applicants must hold an undergrad degree in speech pathology to apply for graduate status. 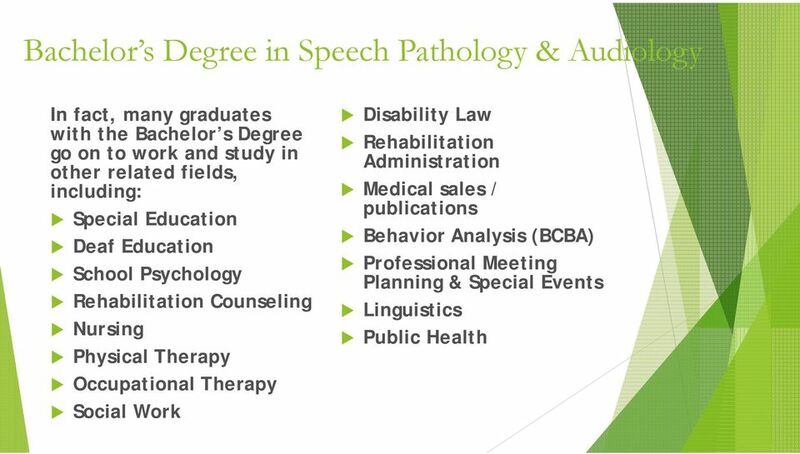 10 Career Options for SP&A Majors Bachelor s degree options: Speech-Language Pathology Assistant (SLPA) The B.S. 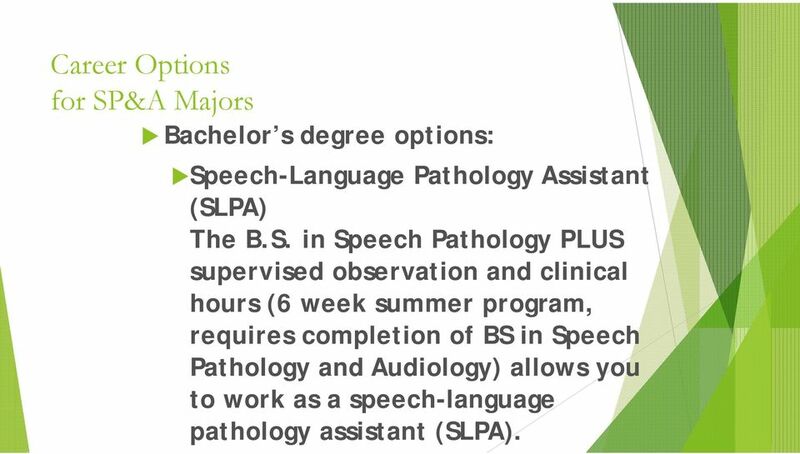 in Speech Pathology PLUS supervised observation and clinical hours (6 week summer program, requires completion of BS in Speech Pathology and Audiology) allows you to work as a speech-language pathology assistant (SLPA). 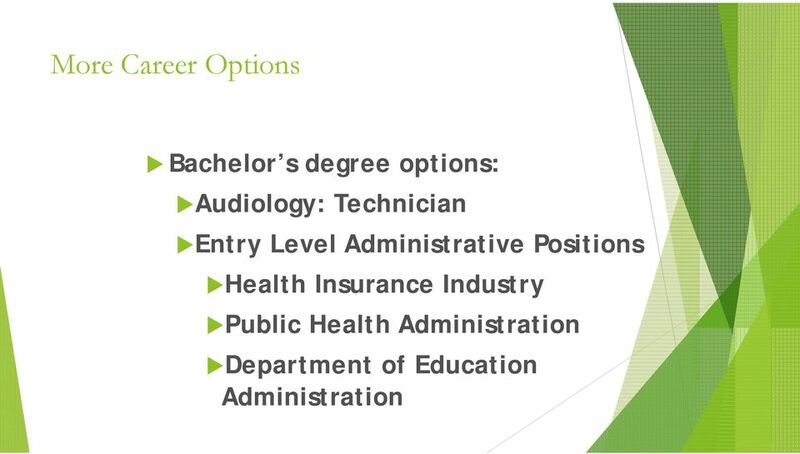 16 Career Paths Master s degree option: A Master s degree requires that a person has an undergrad degree as well as two additional years of graduatelevel course work and clinical supervision. 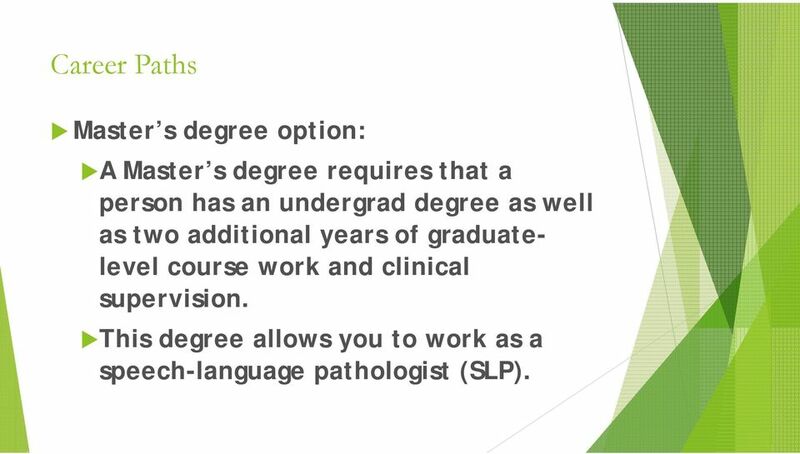 This degree allows you to work as a speech-language pathologist (SLP). 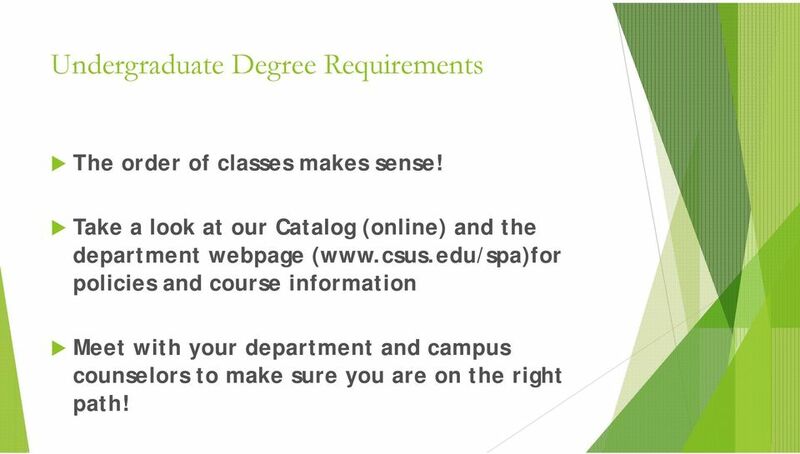 18 Undergraduate Degree Requirements The order of classes makes sense! 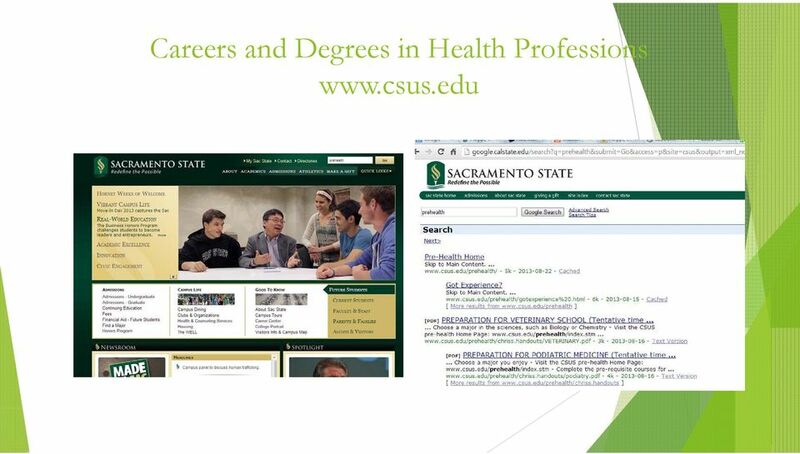 Take a look at our Catalog (online) and the department webpage ( policies and course information Meet with your department and campus counselors to make sure you are on the right path! 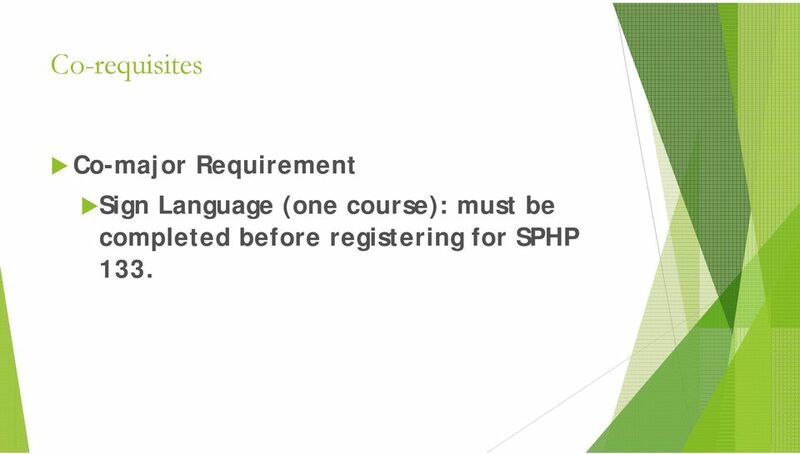 20 Co-requisites Co-major Requirement Sign Language (one course): must be completed before registering for SPHP 133. 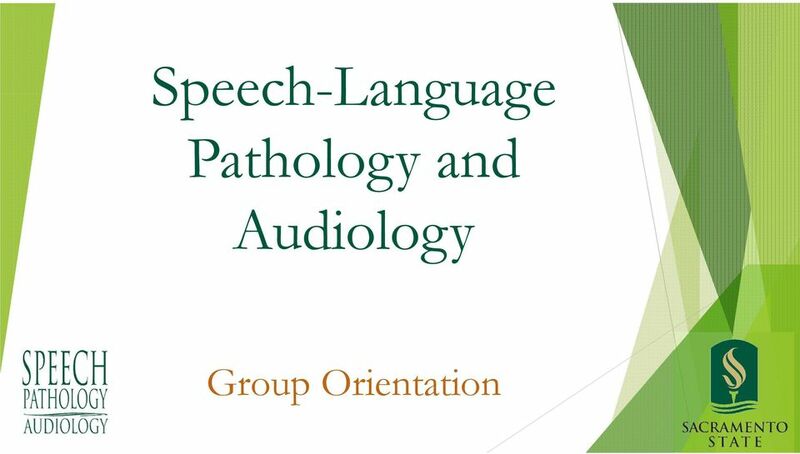 24 MANDATORY Junior Orientation All students in Junior level Speech Pathology & Audiology major courses for Fall 2014 (SPHP 110, 111, 112, and 145) will attend: MANDATORY Junior Orientation Location and Time TBA (within the first two weeks of school). Freshman and Sophomore students are encouraged to attend. 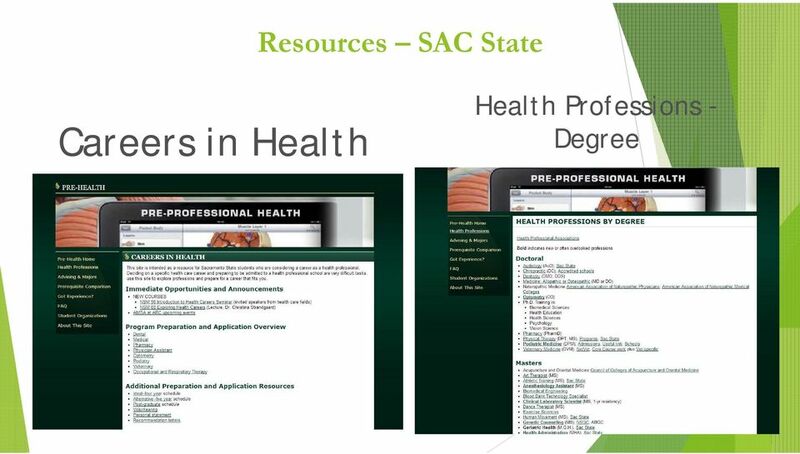 26 SacLink & MySacState Messages All course, campus and department s will be sent to your Saclink address. Make it a habit to check it daily. 35 Study Tips Checklist Courtesy Of Dr. Roseberry-McKibbin Review each day s lecture notes later that same day to aid retention. Review a lot! Be sure to read the readings at least several times, and study them carefully. Visualize what you are reading. Study with other people. Recite and write; repeat material out loud. Write it out in longhand. Repeating/reciting and writing help solidify information in your memory. Study a little every day rather than having 1-2 cram sessions. It is better to study minutes a day than in two 5-6 hour sessions. 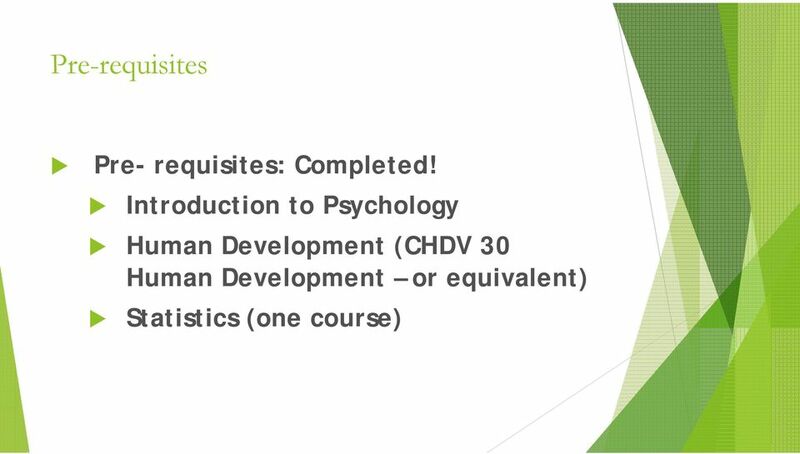 Remember, every course unit = 3 hours of studying outside of class a week. So, for example, for a 3-unit class, you d study/do homework 9 hours a week. DO THE READINGS BEFORE CLASS. Make flashcards for key terms. Carry these flashcards everywhere you go and review them whenever you have a minute. Put the term/definition on one side and the exact definition from the book on the other side. Do not rewrite the definition in your own words! E.g. : Front of card: Back of card: HYPOTHESIS Prediction about future behavior that is derived from observations and theories REMEMBER: IN ORDER TO GRADUATE WITH A BACHELOR S DEGREE IN SPEECH PATHOLOGY, YOU NEED A MINIMUM GPA OF 2.5 IN MAJOR CLASSES. Applying to graduate school here requires at least a 3.0. 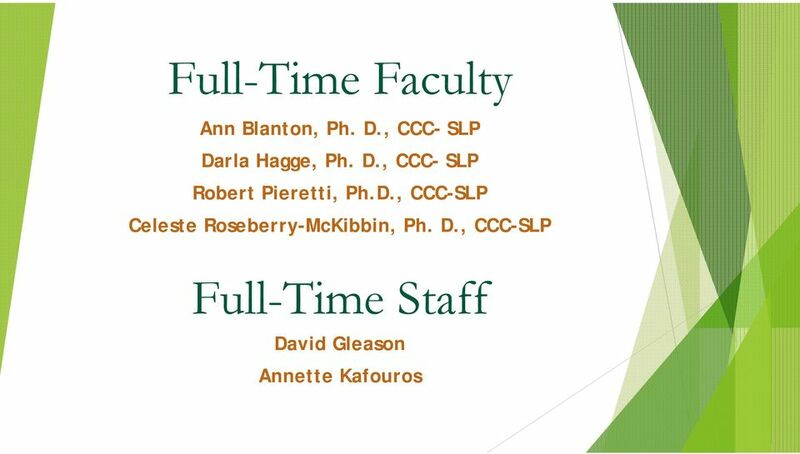 Admission to graduate school usually requires a much higher GPA. 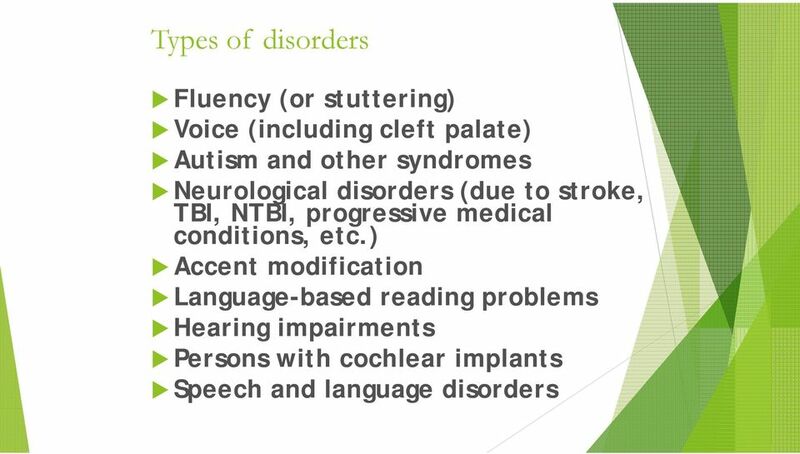 Communicative Disorders - Speech-Language Pathology Option, M.A. All Things Considered for Students Applying to Graduate Programs Normally during the second semester of your junior year, you should begin thinking about where you might want to attend graduate school. Step 1: University 1. 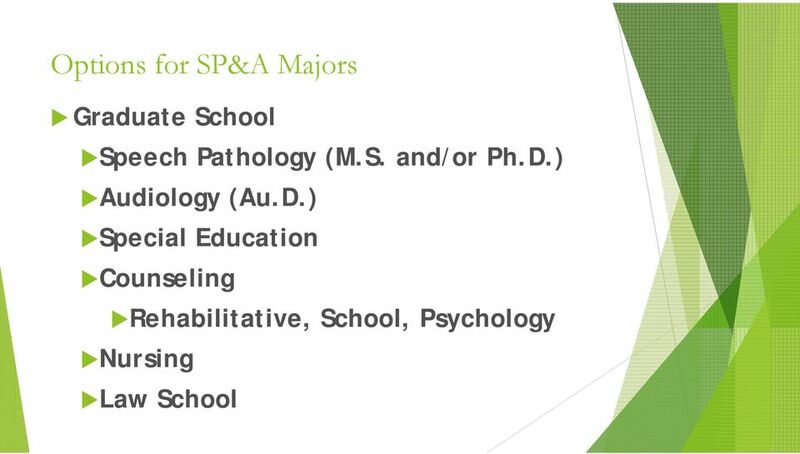 Meet the criteria for acceptance by the University as a graduate student. 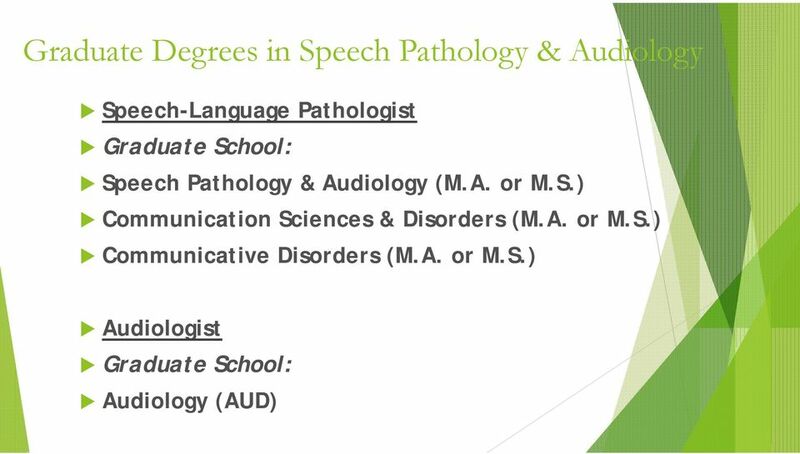 Ph.D. in Communication Sciences and Disorders (Audiology or Speech and Language Pathology), including a joint M.S./Ph.D. 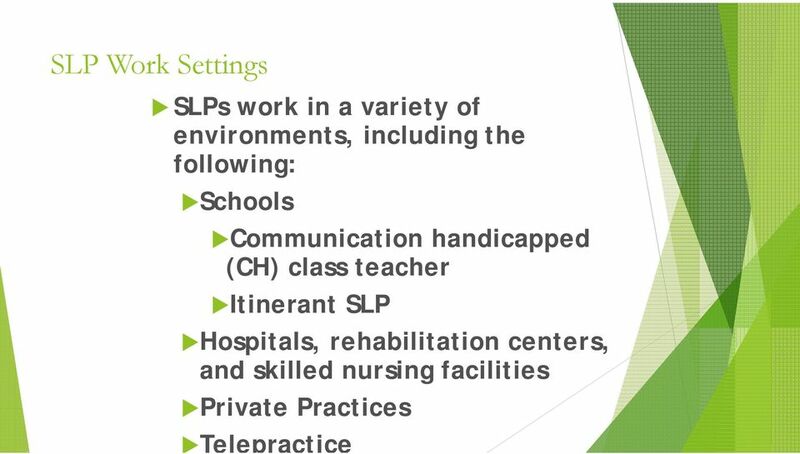 Speech- Language Pathologists in Your Child s School What does the SLP do in schools? Screen students to find out if they need further speech and language testing. 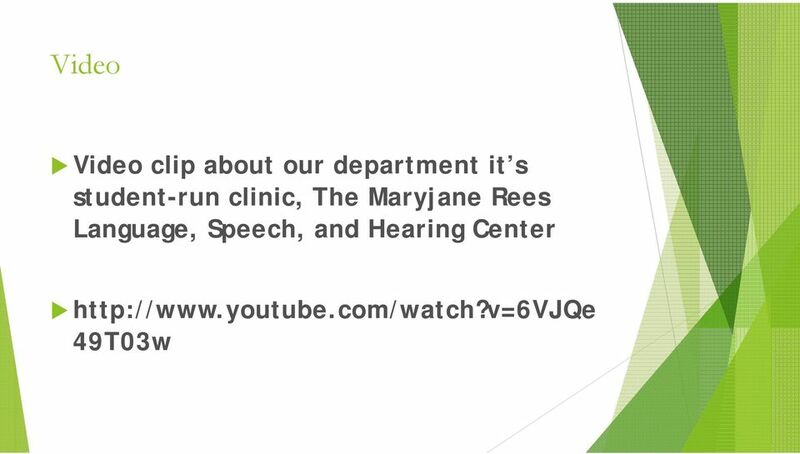 Evaluate speech and language skills.